Photographing glass objects in a studio setting can be tricky, but there are simple techniques that produce stunning results. 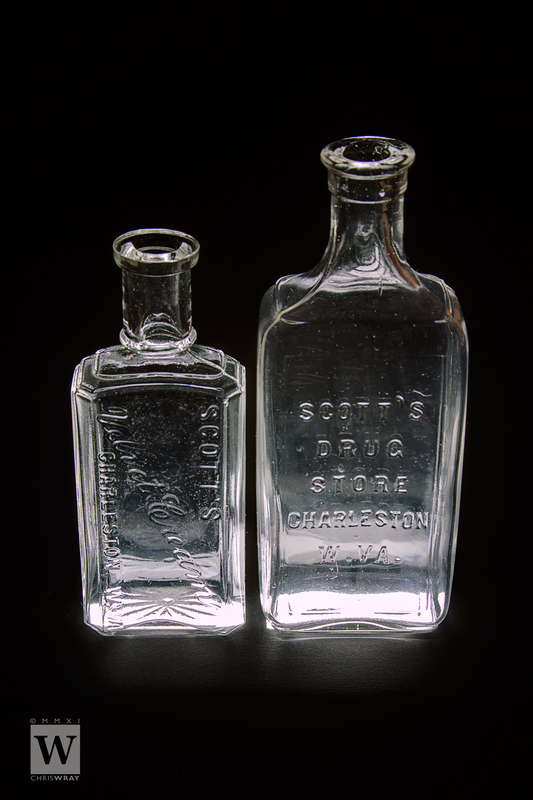 Glass objects like faceted crystal, etched glass and bottles can be lighted from underneath to produce dramatic illumination. This effect can be accentuated by placing the objects on a dark background. A light tent and daylight balanced illuminated flat panel are recommended for this table-top setup. I used an EZcube light tent and an old slide sorter light box. Place a large piece of matte black art paper over the light tent’s nylon sweep to create a continuous, seamless backdrop. The glass object is placed over a hole in the black paper that sits atop the light box. 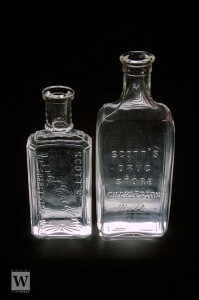 When the light box is turned on, the glass is evenly illuminated against the black backdrop. My post processing involved taking three auto exposure brackets (-2EV, 0EV, +2EV) and merging them using the exposure fusion process in Photomatix. The resulting image created a jet black background and brilliant, crisp glass. 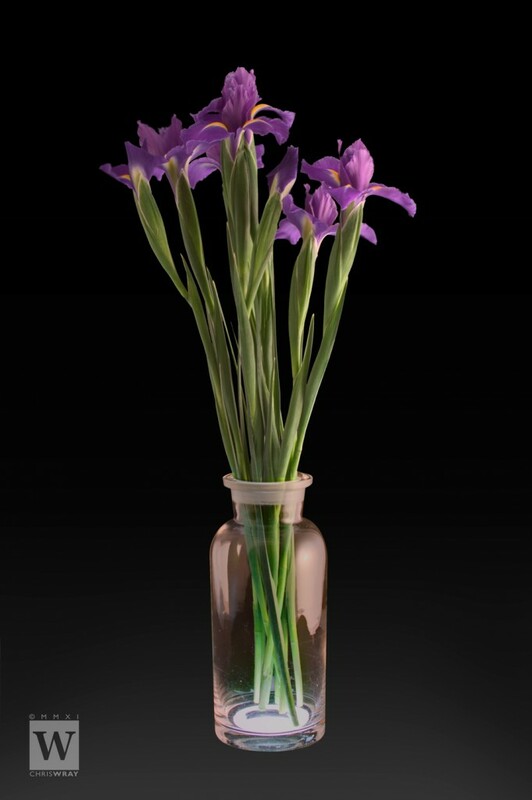 Experimenting further, I added some fresh Iris to the apothecary bottle. The flowers needed more illumination, so I added diffused light through the light tent for a soft, even glow. This lighting added some unwanted illumination against the background sweep in the overexposed shot. After performing exposure fusion, I doctored the image using Topaz Remask. This is a great software tool for ridding of unwanted backgrounds. Together with the layer mask feature in Photoshop, I was able to create a composite image with continuously dark background and evenly illuminated flowers. Give it a try and have some fun! 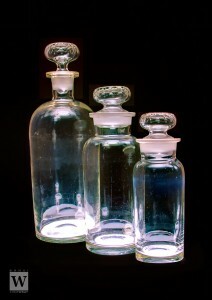 For more detailed information about glass photography, check out Table Top Studio. Here is a thorough tutorial on the recently released Topaz Remask 3. Tip: cut the light hole slightly smaller than the footprint of the glass object. Tip: Photomatix's exposure fusion for black backgrounds, crisp glass. Great little tutorial, Chris! What did you use for lighting? Was is constant (I’m assuming as you’ve stated you took multiple exposures) or flash? I’ll have to give this a try. I love playing with stuff like this! Thanks for your comment and question, Chris. No flash was used for this set up. The light box source was fluorescent and the fill lighting (used only in the iris shot) was—believe it or not—a GE Reveal incandescent light bulb and an inexpensive goose-neck desk lamp! It’s a cheap but effective way to illuminate a still life. The GE Reveal incandescent uses a rare earth element (neodymium) that provides a pure, clean light by filtering out much of the dulling yellow cast common from ordinary light bulbs. My camera setting was preset to Auto White Balance. The overall result was a balanced, clean white light, despite the fact that the light sources were mixed (fluorescent and incandescent). Hi Chris, i have been asked to photograph an etched glass door in situ. There is a large window behind it (orange curtains!) and i have limited equipment, including off camera flash and umbrella. Help!